One of the things that has helped keep the fires stoked for collectors are reference books. I've got a cabinet full of them ranging from John Howes early attempt at cataloguing western whiskies to Rick Simi's excellent work "Gold Rush Camps and Bottles of Sierra County". 2016 Nevada Bottle Book, Volume 2. Having been an active digger in the Silver State "back in the day", I personally am looking forward to obtaining a copy. 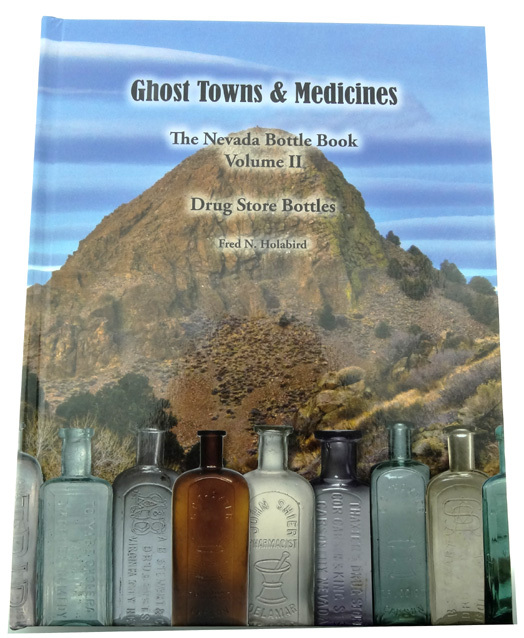 Ghost Towns and Medicines is the new 2016 Nevada Bottle Book, Volume 2. The 480 page tome has extensive histories on the merchants who bottled goods in Nevada embossed drug store bottles. It complements Volume 1, which discussed whiskey, soda, beer and other merchants. "This volume completes the forty year project, which he approached as a science project. Immersed in gold mining for all of his career, Holabird tells personal stories throughout the book that relate to exploration projects that overlapped with historical research on the many Nevada merchants. There are more than 3000 illustrations that represent period advertising, photos of ghost towns then and now, including many photographs by guest photographers. The bottles themselves are analyzed by varieties, with dates applied to specific varieties in many cases." In my book, this is a steal of a deal! I have had the book for a couple weeks now. It is a super reference but goes beyond that. This book really captures the old west, and Nevada. It is a bargain at the price. Dale M.